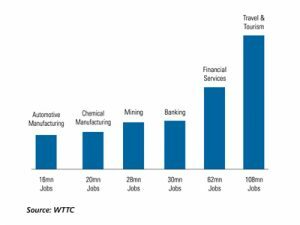 A recent report by World Travel and Tourism Council (WTTC) suggests that total contribution of tourism to global GDP will grow to USD 12,450.1 billion (11.7% of GDP) by 2028. Further, according to the report, total employment contribution of tourism sector accounts for 9.9 per cent of global employment in 2017, supporting twice as many jobs as financial sector. 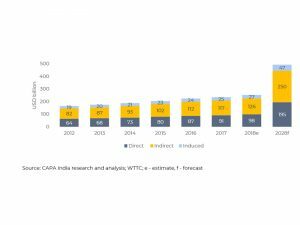 Travel & Tourism investmentA recent report by World Travel and Tourism Council (WTTC) suggests that total contribution of tourism to global GDP will grow to USD 12,450.1 billion (11.7% of GDP) by 2028. Further, according to the report, total employment contribution of tourism sector accounts for 9.9 per cent of global employment in 2017, supporting twice as many jobs as financial sector. Travel & Tourism investment in 2017 was $882.4 billion, or 4.5 per cent of total investment. It is projected to rise by 4.3 per cent per annum over the next ten years to $1,408.3 billion in 2028 (5.1% of total). 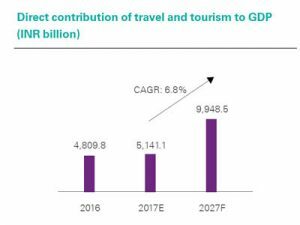 Tourism contribution to global GDP (10.4 per cent in 2017) is higher than many other sectors. 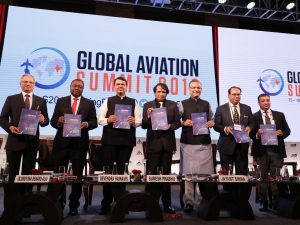 The GDP in Delhi in terms of travel and tourism is set to experience double-digit growth over each of the next 10 years (10.8%), according to a recent report by World Travel & Tourism Council (WTTC). 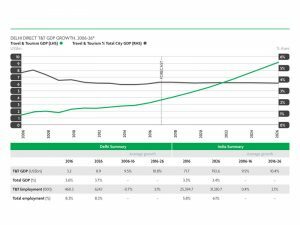 Its share of overall city GDP will remain relatively unchanged from the current 3.6 per cent as other industry sectors also gain prominence. The sector’s share of Delhi’s employment is also set to remain steady at 8.3 per cent over the years to 2026. The Capital generated US$3.2 billion from travel and tourism in 2016, just over one third coming from international visitors. Delhi has much less source market dominance than in other Asian Pacific cities, however, with the largest market, the US, contributing just 11% of inbound traffic.